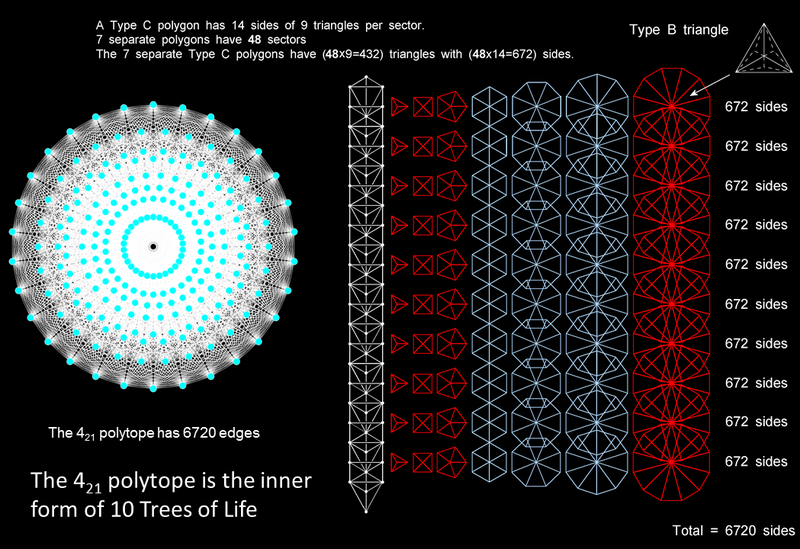 The 6720 sides of the 4320 triangles making up the 70 Type C polygons in half of the inner form of 10 Trees of Life correspond to the 6720 edges of the 421 polytope. The 240 corners of these triangles correspond to its 240 vertices. Each half of the inner form of 10 Trees of Life represents a 421 polytope that maps the symmetries of E8. The complete form represents E8×E8. We found in #21 that 6720 yods other than corners of sectors surround the centres of the 48 sectors of the seven separate polygons of the inner Tree of Life when they are 2nd-order tetractyses. We shall now show that the 70 separate Type C polygons with Type B triangles as their sectors generated by 10 overlapping Trees of Life contain 6720 sides that match the 6720 edges of the 421 polytope. (the diagram illustrates the former division). Each set of three or four polygons contains (9×24=216) triangles with (5×24=120) corners and (14×24=336) sides, i.e., 672 geometrical elements. Each set of 30 or 40 polygons generated by 10 Trees of Life has 2160 triangles with 1200 corners and 3360 sides (6720 geometrical elements). They correspond to the 3360 edges in each half of the 421 polytope. Article 64 analyses the 24:24 division in the seven polygons of the inner Tree of Life. Its two halves correspond to the two halves of the 421 polytope. The four separate, red polygons with 24 corners have (63=216) triangles, whilst the remaining three separate, light blue polygons with 24 corners have (33+43+53=216) triangles. To complete the discussion, let us now determine the numbers of corners, sides & triangles making up the seven enfolded Type C polygons. The seven enfolded, basic polygons have 47 sectors with 41 corners and 88 sides. Inside a Type B triangle are four corners & 12 sides of nine triangles, i.e., 25 geometrical elements. Inside the 47 Type B sectors are (4×47=188) corners & (12×47=564) sides of (9×47=423) triangles. The seven enfolded, Type C polygons have (41+188=229) corners & (88+564=652) sides of 423 triangles, i.e., 1304 geometrical elements. The (7+7) enfolded, Type C polygons have 456 corners & 1303 sides of 846 triangles, i.e., 2605 geometrical elements. 229 is the 50th prime number. This is how ELOHIM, the Godname of Binah with number value 50, prescribes the number of points defining the shapes of the seven enfolded polygons when they are constructed from triangles. 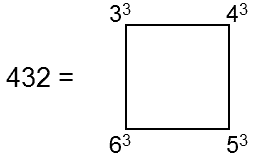 The number of corners outside the root edge = 227. This is the 49th prime number, showing how EL CHAI, the Godname of Yesod with number value 49, prescribes the part of the inner Tree of Life outside its root edge. This is the number of yods other than corners of polygons in the (7+7) enfolded Type B polygons because the latter have 1370 yods, of which 70 yods are polygonal corners.